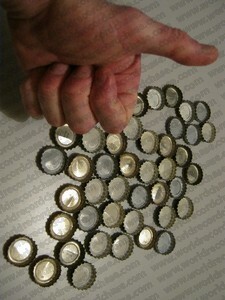 I recently completed work on the Largest bottle cap sculpture and have spare metal bottle caps. One morning, walking into the box by mistake, I thought I need to do something meaningful with the left-overs. I picked one cap up and flipped it in my palm repeatedly. The crenulation-like edges dug into my skin, but the outer top surface was as smooth as oiled glass. Ideas flicked through my mind. How could I use these? The caps wouldn’t grip each other, I thought, but they might lean into one another easily enough. Later, I dedicated 20 minutes to understanding how metal bottle caps behaved. I studied their weight, how that affected their reactions to gravity, what happened when I mixed the caps in a bag, and trends which developed when I changed their centre of gravity. These little fellows would be tough to control, I concluded. So, cup of tea in hand, I pondered what the future of these caps would best be. And a few minutes of lateral thinking later, I had the solution. The caps were in a heap on a table, I had a half-filled glass mug in my grip, and I could feel moist residue of my last sip of tea on my lower lip. A pile of caps. A container. My mouth. By using all three of these, I could transfer caps with my lips. I slurped down the last of the tea and knelt at my office desk – it gets used for the most ridiculous activities, I will admit! Using the stopwatch I usually set up during my storytelling I pecked one cap into my mouth at a time and moved it at speed into a breakfast bowl. Most of them bounced off the porcelain and out the other side. That wasn’t going to work, I decided. I got a bigger, wide-mouthed bowl. This time, fewer caps bounced right out. But I was still not satisfied. Besides, I was too slow. I envisioned a sloth trying this, and failing dismally at a timed world record. I was faster than any sloth would ever be, but still not good enough for this challenge. I gave a quick thought to those sloths which haven’t yet lost their homes to companies chopping down the last of the south American jungles to make cheap furniture, and returned to my bottle caps. I took a number of deep breaths, then slammed my pursed lips into one cap which bounced out of my sight. I slid my mouth to the nearest carefully positioned cap, snatched it up and spat it into the bowl. It remained there. Great. I increased my speed but still did not please myself. I tried placing a towel in the bowl to absorb any bouncing, but that didn’t work. While taking a break, my phone rang. It was a friend asking me to care for a young man with Down syndrome, Scott. Identifying an opportunity, I agreed, and I’m glad I did. Scott was pleased to see me, since we’re great friends. But this visit was to be different: Scott was going to time me tossing bottle caps. I turned off his TV and explained the day’s plan. His eyebrows lifted and I knew this was going to work. Within half an hour, Scott was excitedly timing me, and I had knelt alongside the coffee table in the lounge, ready to move caps as fast as possible. “Go!” exclaimed Scott. I sucked up the first cap, pulled my head to the left with great force, steadied it a split second later, and spat out the cap over the wide bowl. It hit the bowl base with a click, by which time my head was already 30cm to the right, zooming in on the next cap. And so it went, until the timer went off and Scott yelled for me to stop. Fail. I still wasn’t fast enough. But there was only one way forward: repeated practise. Scott agreed, so after a break, we got into the action once again. And again. And again. By afternoon, we were both tired. And without expecting it, I suddenly did well. I transferred 30 caps in just as many seconds. My head was spinning. The lounge was dancing around my head, and Scott seemed to have multiplied into several people. Quiet clearly, my brain wasn’t made for such shaking. Both of us counted the caps with a feeling of certain success. I was relieved. I could so easily have broken a tooth by hitting it into the table, or on the side of the heavy bowl. But fortunately, the only thing broken – I hoped – was a world record. And soon after sending the evidence to the judges, that’s just what transpired. Cool! I’d landed another world record title. Perhaps it was the support which Scott gave me that motivated me to keep attempting this until I succeeded. Wonderful.